Just before Christmas I tied in a business meeting with a trip to Ormond Castle, just outside Avoch. The castle is not one that springs to mind when you think of Scottish castles, but it is an excellent example of the use of natural strong points in Scotland during the medieval period. The Castle Hill at Avoch is a large oval shaped hill, about 200m long on its SSW-NNE axis, and maybe 100m wide in the middle, which rises a good 20m above the surrounding land. To the south-east, the land drops away directly to the shore of the Moray Firth. On its summit are the scant remains of the medieval castle. 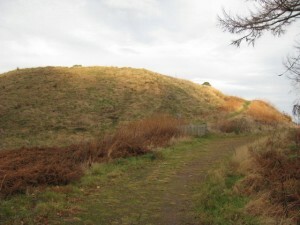 At the northern end, a deep ditch and bank have been cut into the hillside, which may have provided the material for the ramp which provides access to the castle. The path up the ramp then follows the base of the ditch around the south-eastern side of the castle, and along a terrace to the southern end. A further ditch this end separates the castle hill from the higher ground of Wood Hill. This has been partially filled to allow the path to cross it, where it continues into the woods. At this end of the castle hill, an uneven (and slippery!) narrow track leads up towards the castle. 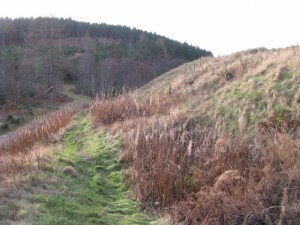 This track climbs up the side of the hill to reach a broad sloping terrace which runs almost a third the length of the hill before narrowing to become part of the steeper hillside. It is possible to walk along here to the northern end, but not advisable as the ground is uneven and overgrown, and increasingly steep. 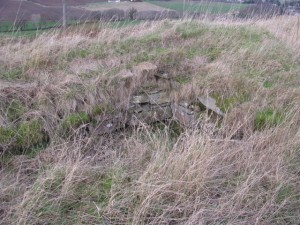 Roughly in the middle of this terrace is what has optimistically been referred to as a well, which is a small circular stone lined hole with water in that is almost certainly filled in for most of its depth. The track climbs and turns back on itself around the base of a very steep slope and climbs towards the higher ground of the true summit, revealing the second level to the south. 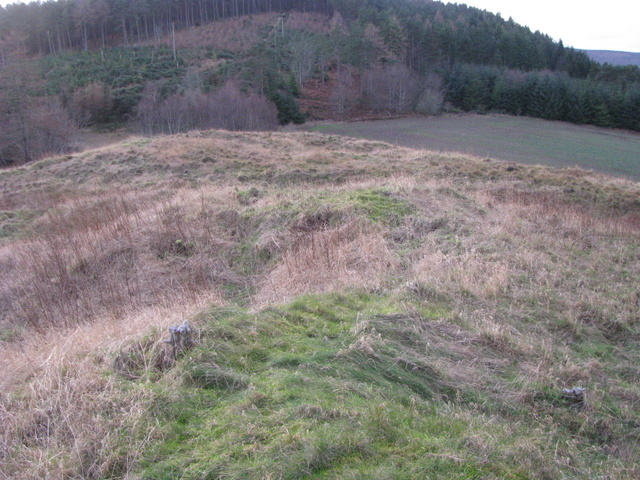 This fills the southern end of the hill, and is separated from the highest level by a ditch, which has eroded badly in places, but seems to have crossed the whole width of the hill, and to have had a causeway across the centre. 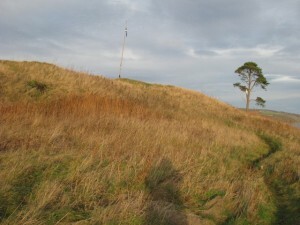 The part of the hill above where the path doubles back has walling along at least part of the top, and it is therefore possible that a tower overlooked the path at this point. Crossing the causeway over the ditch into this southern ward, it is possible to identify what seems to be the footings of buildings, as well as a possible cross wall, although this may be a later agricultural feature. Angus Beaton, who carried out a survey and limited excavation in 1883, identifies a tower in the far southern corner, which I could see no evidence of, although the ground level is slightly raised at this point, perhaps indicating the footings of a tower. Traces of a perimeter wall can also be seen running from this point to the possible tower site overlooking the access track. Although Beaton has deduced that the perimeter wall goes right the way around this triangular southern ward, I couldn’t see any evidence of it on the western side. Crossing back over the causeway and ditch, the ground climbs up to the highest level of the castle, where the most obvious and significant remains survive. There is almost nothing left of Ormond Castle today, although the outline of part of the quadrangular inner ward can still be traced, along with the great hall. During the excavations were carried out by Angus Beaton in 1883, only a small part of the site was examined, which revealed the traces of a square tower at the southernmost corner of the inner ward. At that time, Beaton admitted that he was only able to approximate a layout based upon the turf covered footings of the walls, and produced a rough plan which I took a copy of to the site. It is clear from looking from the entrance to the southern ward that there is a central spine to the right which leads to the highest point of the hill, and that the western side is considerably lower than this ridge. 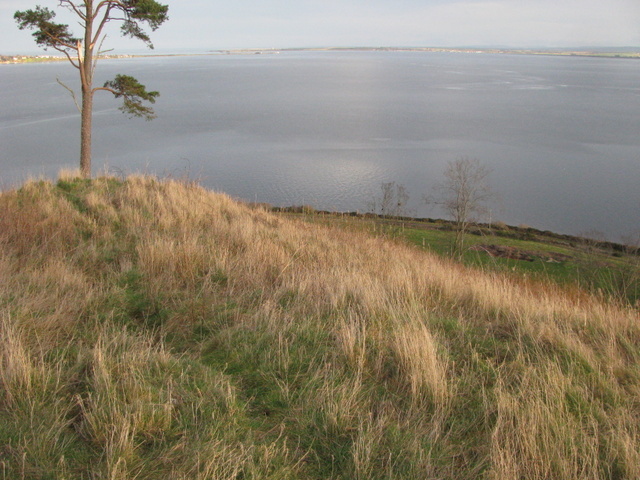 Climbing up the slope to this spine gives a spectacular view across the Moray Firth, and from the northern end of it straight out to sea. It also gives a very clear view over the western part of the inner ward, which slopes sharply away to the west. From here the rectangular outline of the hall can be seen, as well as the remains of Beaton’s square tower. However, it is only the inner face of two sides of the tower which can be clearly seen, and these are made of irregularly sized flat stones which appear to be of drystone construction, although it is quite possible that the mortar has just eroded away. Regardless, if it was a castle tower it was quite small, and was built entirely on the outer edge of the curtain wall, projecting to the south for all its width, and to the west for perhaps half of it. The base of the four walls of the hall is very clear to see, and it is probable that a tower of some sort existed at the corner where the hall meets the possible western curtain wall. Inside the inner ward, in the angle between the hall and the south-west wall, is a very large hole, filled with water when I visited, and protected with a timber and chicken wire cage. This is clearly dangerous, and I did not investigate too closely. Beaton identified it as a tower. I am not convinced of this; it may be the castle well, a drawbridge pit, or a dungeon of a tower was on the site. It was too overgrown to tell! Returning to the spine, there is definitely the overgrown remnant of a wall running the full length of it, and it seems likely that a building of some description was built up against it inside the inner ward. This was identified by Beaton as a tower on the inside of the wall, which makes no sense. I think it more likely to have been a rectangular building, but as this is heavily overgrown it wasn’t possible to gain any real idea. The summit of the Castle Hill is at the northern end of this spine, and had a memorial with a flagpole built upon it in 1997. 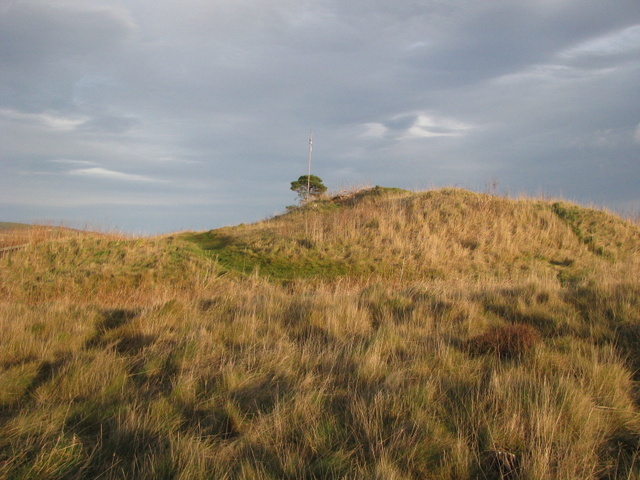 The memorial commemorates the 700th anniversary of the “the North Rising and raising of the standard” and was erected by the Andrew de Moray project. From this point, which is recorded by Beaton as the site of the east tower of the inner ward, traces of the north-east wall can be seen, particularly towards the western end of the slope. At the edge of the hill, the wall definitely continued southwards to meet the hall and complete the quadrangular inner ward. 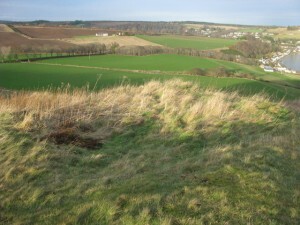 There are hints of buildings which may have lined the north-east wall, and may have consisted of two rectangular halls. To the north of this, the hill slopes away fairly steeply to a very uneven northern ward which overlooks the deep ditch and approach path. The spine of the hill also slopes away, although there is a further high point which Beaton identified as the site of a further tower, linked to the north-east wall of the inner ward by a curved wall section. I couldn’t see any evidence of the wall at all, and no evidence of this tower, although this part was again extremely overgrown. 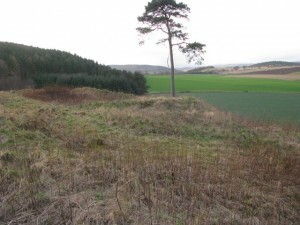 Beaton also records that a curtain wall footing could be traced around the edge of this northern ward; again I couldn’t see any clear evidence of it. There is, however, a well defined second ditch and bank which is not on his plan, and this may contain the footings of a wall. Below the line of the perimeter wall, and on the north-west side of the Castle Hill, there is the trace of a narrow terrace or path, but this fades out as one approaches the edge of the inner ward, and this may be a natural feature rather than a fighting platform or early access path for a sally-port. 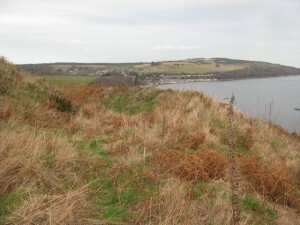 Ormond Castle is said to have been one of the two castles founded on the Black Isle during the MacWilliam rebellions of the late 12th century. King William certainly is recorded as having fortified two castles in Ross in 1179, “Edirdovar” (normally associated with Redcastle) and “Dunschath” (Normally associated with Dunskeath, near Nigg). The castle was certainly known by another name in its earliest days – Ormond appears to date from the 15th century – and it is likely that the original name was just the Castle of Avoch, as recorded by Wyntoun before 1406. 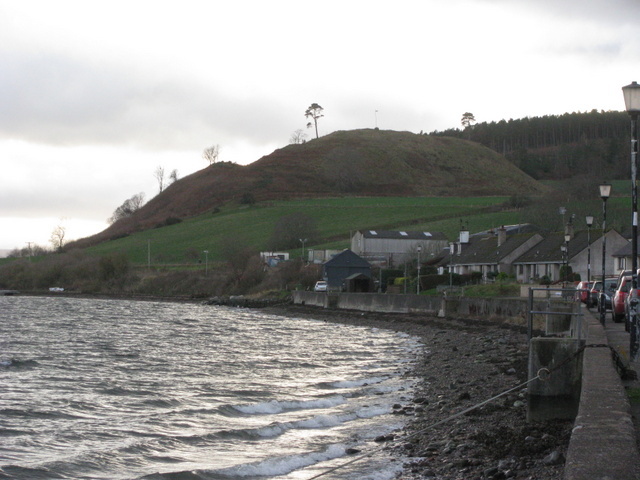 As Avoch is known to have been a current name in the 1257, appearing as “Awach”, it seems likely that any castle built here would retain that name. 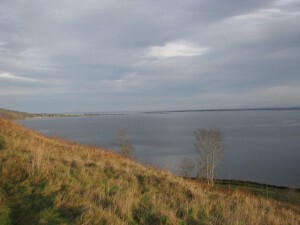 King William did build two further (unnamed) castles in Ross during the first of two campaigns in 1211, when Guthred MacWilliam led a serious revolt against him. When he left the north, Guthred was able to use siege engines to overawe the defenders of one of these castles, and then burned it to the ground. In 1212, the future Alexander II led an army back to the north, and Guthred was handed over and executed. If it was founded by King William, it was in 1211 that Ormond Castle was first built, not in 1179. However, as King William’s castles were distinctly less formidable, it is quite possible that the castle was actually founded by one of the de Moravia family rather than the King, but this would still most likely date to around the second quarter of the 13th century. In its early form, the castle was probably a rectangular enclosure surrounded by a timber wall, with a ditch protecting the entrance point, probably on the southern side. It is possible that there was a second ward to the south, also surrounded by a timber palisade, but this would have been a secondary phase in all likelihood. Wooden or even turf buildings would have been built inside the rectangular enclosure, and if towers were built, they would have been basic timber structures accessed by ladders. The inner ward defences would have been rebuilt in time in stone, along with a great hall of sorts, and probably a chapel, whilst other buildings would have remained timber for longer. Further defences to the north, such as a watch tower, may have been erected during this process as well, and potentially a second outer ward could have been fenced off to the south as the castle grew. The castle was certainly founded by the end of the 13th century, and was held by Sir Andrew de Moravia in 1297. Sir Andrew had been captured in 1296 fighting the English at Dunbar, and died in the Tower of London in 1298. Sir Andrew was married to a daughter of John Comyn of Badenoch, so the Morays were loyal supporters of King John Balliol, and fighting for his restoration to the throne. Their son Andrew (II) was the Andrew Murray who was killed at the Battle of Stirling Bridge in 1297 fighting alongside William Walace. His son, the third Sir Andrew was born shortly after the Battle of Stirling Bridge, and was therefore too young to be involved in the battles of Robert Bruce to become King. As he was to marry Christina Bruce, the King’s sister in 1326, it is clear that he was reconciled to Bruce’s reign by the time he was an adult. In 1351, King David was in Scotland negotiating with the nobility about raising the ransom for his permanent release from captivity in England, having had a number of nobles held hostage for his return. Sir Andrew’s elder son Sir John was one of those hostages, and died in England in that year, to be succeeded by his younger brother Sir Thomas as Lord of Bothwell, who was one of the nobles named as hostages if ransom installments were not made on time in an agreement of 1356. In 1358, Thomas was sent to England, and died there in 1361. Both are known to have been adherents of the Steward, and therefore of the faction opposing the King. It is interesting to note that they were only referred to as Lords of Bothwell, suggesting that Avoch was no longer a separate title, or at best a junior one. However, the next known occupant of the castle is Hugh Douglas, who took the title Earl of Ormond, possibly a corruption of “Avoch mount”. He was known as this from 1445. Thomas de Moravia’s widow, Joanna de Moravia of Dumsargard, remarried after his death, and her husband was Archibald the Grim, the 3rd Earl of Douglas, who was then granted the lordship of Bothwell. 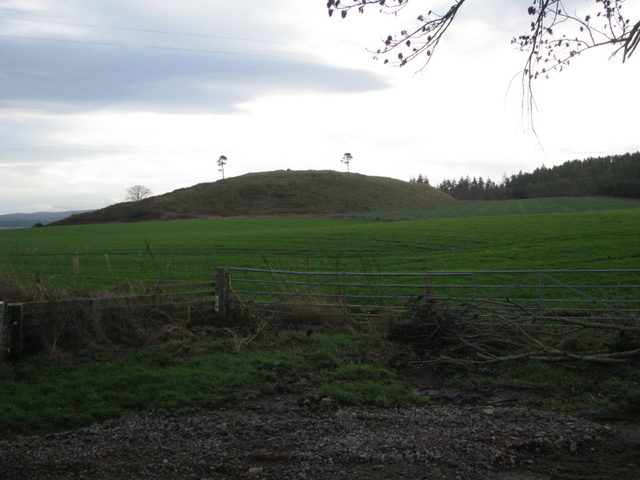 As he was the grandfather of High of Ormond, it is very likely that Avoch remained part of the Bothwell inheritance, but was just not mentioned, and therefore passed to the Douglases by marriage. Hugh was born after his brothers James and Archibald, who were born in 1426, so when he was created Earl of Ormond he was only nineteen at most. He was the leader of the Scottish army which defeated the English under Henry Percy at the River Sark in 1448, on the borders near Lochmaben, and was left to manage the estates of his brother the Earl of Douglas in 1450, when he left the country on a pilgrimage to Rome. It is clear from this that he did not spend all of his time at his castle at Avoch, but not very much is known about Hugh’s activities. In 1452, when the Earl of Douglas was murdered by King James II, Hugh renounced his allegiance to the King and rebelled. 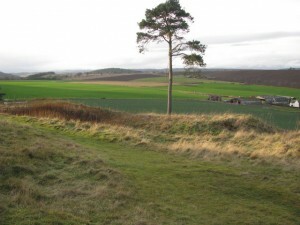 At the Battle of Arkinholm on the edge of Galloway on May 1455, the Douglas brothers were defeated. Hugh was captured and put on trial, and executed, his estates forfeited to the Crown. It is likely that under the Douglases the castle of Ormond was at its peak, the inner ward consisting of a high curtain wall with towers positioned at the two corners facing the Firth, and hall blocks lining at the perimeter; with the Earl’s hall probably a tall three storey building. The entrance to this ward was probably either a simple gate facing the triangular southern ward, or possibly through a more complex structure to the north, perhaps including a barbican. If the outer wards were walled, this was a fairly simple structure, perhaps with a watch tower at the southern tip of the hilltop. How the castle was reached is not clear, but it may have been from the south, with the modern access route from the north and ramp being of later construction. King James II retained Ormond with its strategic location until his untimely death in 1460, and it was a property of the Crown throughout the minority of James III, presumably with a constable, although we have no records saying who it was. In 1476, King James created his second son Marquis of Ormond at his baptism, a title which he held until he was made Earl of Ross in 1481. This included a grant of the lands of the lordship of Ardmeanach, with the moot hill of Ormond and the castle and fortalice of Redcastle. No mention is made of a castle at Ormond, which may have been slighted during the Douglas rebellion. In early 1488, King James upgraded the Earldom of Ross to a Duchy and the lordship of Ardmeanach became the Earldom of Edirdale. The Marquisate of Ormond remained specifically associated with Ormond Castle and the lands of Avoch. James III may have planned for James of Ormond to become King, as he was constantly favoured over his elder brother who was the focus of discontent with the King’s rule – even in marriage negotiations, when as Marquis of Ormond he was put forward as a potential husband for Katherine, the daughter of Edward IV of England, and his elder brother was overlooked. Four days after James became a Duke, his elder brother left the King’s custody without permission, and rebelled, with the end result that James III was killed, and the elder brother became James IV. From 1488 until his death in 1504, James of Ross was the heir to the throne of James IV. However, he was possibly a political rival to the King, declining to go on campaign with him against England in 1496. He is known to have been an associate of Archbishop Scheves, one of the intimates of King James III and considered to have been a “bad advisor,” so Ormond Castle may have been the site of meetings between the two if it was inhabitable at the time. After Scheves died in January 1497, Ross was appointed Archbishop of St Andrews in his place, and was sent to Rome at the end of the year. He was then made commendator of the Abbeys of Holyrood, Dunfermline and Arbroath Abbeys in 1498, 1500 and 1503, and in 1501 was made Chancellor. Regardless of whether James of Ross was involved in plotting against the King, or if his association with Scheves was training for his envisaged clerical role, the majority of his time was spent away from his northern lands, and it seems that the King at least trusted him; the concentration of so many titles and roles made him extremely wealthy and powerful, clearly the second man in the Kingdom. However he died suddenly in Edinburgh in 1504, aged only 27, and his titles reverted to the Crown again. There is a charter in which James of Ross resigned his lands to the Crown, which is from about 1503, referred to by Lord Hailes in 1770 in the “Additional Sutherland Case” which I haven’t been able to find a text for, but his death very shortly afterwards and the approximate date of the charter makes the sequence of events hard to decipher. In order to keep his titles, he retained the principal messuage of each, however Ormond Castle was undisputably in the hands of King James IV by early 1504 at the earliest, and James’ titles became extinct. During the reigns of James V and Queen Mary, grants were made from the lordship of Ardmeanach which refer to the lands and town of Castletoun, but no mention is ever made of any fortifications, which suggests that the castle was ruined and uninhabitable. Timothy Pont, writing towards the end of 1590 mentions “Ormondhill” and describes it as “Castletoun with the ruynes of a castell called the castell of Ormond,” which shows that the castle had been abandoned by that date. The Old Statistical Account records that traditionally the castle was referred to as Douglas Castle, which may suggest that it had in fact been slighted in the 1450s. The ruins of Ormond Castle were finally demolished during the mid 17th century, and tradtion claims that the troops of Oliver Cromwell used the masonry, (along with that of several other sites!) to build his fortress at Inverness. 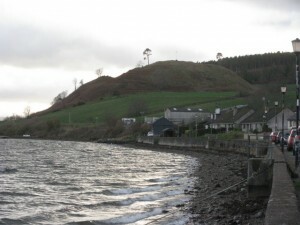 It seems possible that the ramp leading up to the castle mound may date from the demolition of the castle rather than to its years of occupation, although the natural direction of approach would be from Avoch to the north, where ships could have been docked and the lords of the castle disembarked, although they may also have just used either the Ardersier to Chanonry ferry, or that at Kessock. Ormond Castle was a true medieval castle that was occupied for perhaps 250 years, and was perhaps involved in the conquest of Ross and rebellions in the area during the reigns of William I and Alexander II. After this, it was certainly an important focal point in the Wars of Independence, and may have been occupied by the English as well as destroyed on the orders of Robert Bruce, but certainly occupied again by the 1330s. Although not subjected to attack, its de Moravia lords were opposed to King David II as an adult King and were supporters of the Steward. 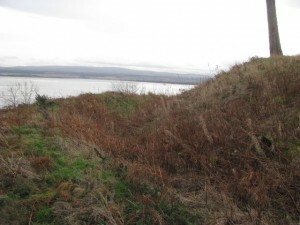 Once it became a Douglas stronghold, Ormond Castle may have been attacked by the Lords of the Isles in the early 15th century when claiming the Earldom of Ross. It would have been a focus of rebellion after the murder of the Earl of Douglas in 1452, and was probably destroyed by royal supporters between 1452 and 1455. The most likely destroyer was the Lord of the Isles, John of Islay, who supported the Crown in this period in order to claim the Earldom of Ross. Today, the castle is all but invisible, but peeling back the layers of history, it is clear that Ormond Castle is worthy of notice, and a walk up to the summit, even if only for the views across the firth. Just make sure it is a dry day, or you may end up sliding down the slopes unexpectedly – as I did!